This stencil resembles a chain link or trelis chain and I just loved how it turned out. My card was made using cardstock and papers from Bazzill and Recollections.I taped down my stencil and sprayed it using my Tattered Angels glimmer mists dragonfly, sweet clover and forest green. I loved the color combination of the greens with the blue and the shine it gives. 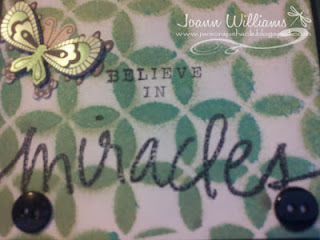 My sentiment " Believe in Miracles" was stamped in momento tuxedo black ink and this is from a stamp set by Little Yellow Bicycle. I added a three dimensional butterfly sticker by Studio 112 as an added embellishment and finished off the card by adding black buttons in the corners. The buttons are by Favorite Findings. I carried the theme of the card to the inside by adding another butterfly and a button. 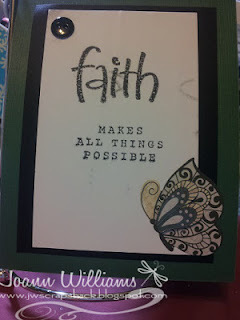 The sentiment inside, "Faith makes all things possible" is also from the same stamp set by Little Yellow Bicycle. Well thats my card for week 8's challenge. Please stop on over and visit Kellie to see her beautiful project for this challenge. Beautiful Card Jo! 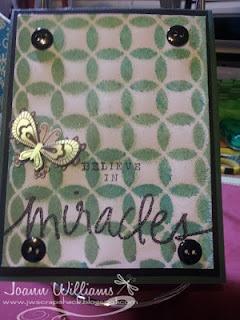 I love the stencil pattern you used and the stamp set! Is it new from LYB or is it an older set? I would like to get it! The butterflies are a nice touch too! well done! Stunning & Beautiful!! !A sweet sentiment! love the background! very pretty card, Jo!